Track racing is to cycling what ‘track and field’ is to athletics, with racing for a wide range of riders and body types, from short, timed, solo sprint races to long, high endurance bunch races. 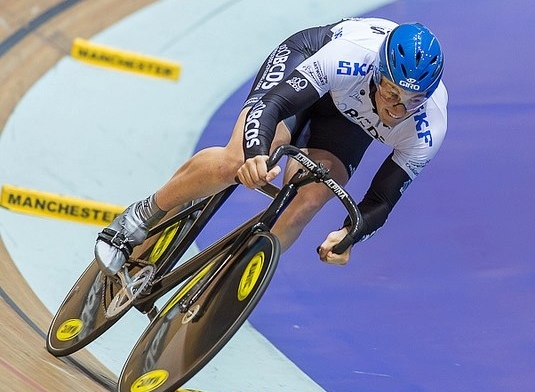 Track cycling is all about speed, technique, tactics and nerve. Track cycling is suitable for a wide range of riders. Sprint athletes tend to be muscular and capable of producing massive power for short distances while endurance riders are lighter and more suited to maintaining high speeds over longer distances. Track bikes are among the simplest types of bike available, with no brakes and a single ‘fixed’ gear, meaning that riders cannot ‘freewheel’. Though simple, the bikes are often technically advanced with the best made from carbon fibre, resulting in light weight yet great strength, stiffness and efficiency. Track cycling takes place on indoor and outdoor oval tracks ranging from less than 200 to over 400 metres in length, with surfaces made from a variety of materials including wood, tarmac and concrete. Tracks are banked to varying degrees to enable riders to maintain high speeds. Olympic standard venues are indoor 250 metre wooden tracks built to a specific profile. A head-to-head contest between two riders over three laps of the track. Competition begins with a timed 200 metre run which decides the seeding for the knockout rounds. Racing is highly tactical yet explosive, with slow ‘cat and mouse’ tactical battles followed by all-out drag races for the line. A standing start all-out effort, the team sprint involves three riders over three laps for the men and two riders over two laps for the women. At the end of each lap the front rider leaves the track until only one remains. Races are short and thrilling, with titles decided by thousandths of a second. Japanese for ‘fight’, the keirin is one for the sprinters. Riders jostle for position behind a pacing motorbike, called a ‘derny’. The pace is increased over a series of laps until with two and a half laps to go, the derny leaves the track and it’s a straight fight for the line. Often physical and explosive, the ‘fight’ always lives up to its name. A pure standing start effort against the clock, the time trial is 500 metres for the women and a kilometre for the men. Either way, it’s known as one of the most punishing of the track disciplines, often favouring sprint athletes towards the ‘endurance’ end of the spectrum. A head-to-head race for the endurance athletes, the individual pursuit sees riders begin from a standing start in pairs on opposite sides of the track, who literally "pursue" each other for 4000 metres (3000 metres for women). After qualifying, the four fastest teams compete for the medals, the fastest two vying for gold and silver, while the third and fourth fastest qualifiers battle for bronze. In the finals, if a rider catches their opponent, the gun is fired and the race is over. Otherwise, the first rider across the line wins. Similar to the individual pursuit but for teams of four riders. Both men and women compete over 4000 metres in this technically exacting discipline, which sees teams ride in formation often just a few centimetres apart. After qualifying, the four fastest teams compete for the medals, the fastest two vying for gold and silver, with the third and fourth fastest qualifiers battle for bronze. In the finals, if a rider catches their opponent, the gun is fired and the race is over. Otherwise, the first rider across the line wins. The points race is a bunch event over a set distance with points available at ‘intermediate sprints’ for the first four riders across the line. Points are also given for lapping the field and the rider with the most points at the end wins. Sounds simple but in reality the points race is one of the most physically and mentally demanding of the track disciplines, with speed, stamina, technical skill and tactical awareness all required in large amounts. The scratch race is the simplest of all the endurance events. It’s a bunch race over a set distance and the first across the line wins. Despite its simplicity, the scratch race can be an enthralling contest, with breakaways, lap gains and bunch sprints. The Madison is named after Madison Square Gardens in New York, one of the birthplaces of track racing. The Madison is a ‘relay’ event for teams of two riders who take turns racing over a set distance. Like the points race, there are points available for intermediate sprints and lap gains and as in the points, stamina, speed, technique and tactical awareness are paramount. The omnium is a multi-event discipline akin to the heptathlon in athletics. An event for the all rounder with a mix of sprint, endurance, individual and bunch events, the omnium rewards consistency across two days of competition. Points are scored according to finishing position, with the rider with the lowest total crowned the winner. You can learn to ride the track at a number of venues around the country, with taster sessions for complete beginners through to more structured, event specific training for more experienced riders. Find a track racing club near you. The track racing season extends throughout the year, with summer and winter track leagues at a number of venues around the country. There is racing for all age groups and a range of abilities. Find a track race near you. Track is one of the most spectator friendly forms of cycling, with all the action taking place in front of you in a self contained venue. Spectators are welcome and usually admitted free at local track leagues while bigger national and international events charge for entry. Support the sport by volunteering your time and skills at your local track event. There are opportunities for a variety of roles including timekeepers, judges and scrutineers. British Cycling has a range of volunteer education courses to support your development. Learn more about British Cycling's support for volunteers.